Jun. 7, 2013 7:00 p.m.
A new sign went up on 4424 – 49 Street in Wetaskiwin announcing a new business, KLEIN Equipment Rentals. But owner, Bart Klein is not new to the business. 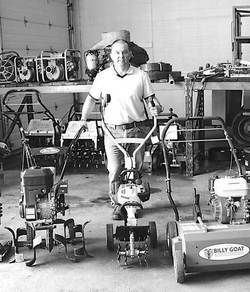 Bart has many years of experience in the equipment and tool rental business so when First Choice was shutting down, he purchased the equipment and moved across town to the new location. Wandering through the shop and around the yard, it is very evident that KLEIN Equipment Rentals is committed to serving Wetaskiwin and region. The new building and yard display a complete line of rental equipment such as skid steers, manlifts, air compressors, compaction equipment, concrete tools, generators, pumps, lawn and garden equipment, heaters, trenchers, to name a few. Add to that, Bart’s experience as General Manager of rentals at First Choice where he strongly promoted the idea that whether it be rentals, sales or service or equipment repairs, customer service was based on action, not words on a promotional item. Watch the supply of equipment grow at the new rental store.